Every year we roll back the clocks across the nation to standard time – and this year, we will do this on November 6th! 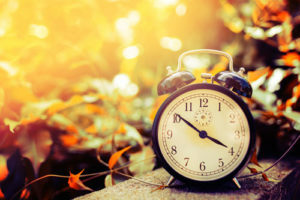 While many of us look forward to the extra hour of sleep we will get, rolling back the clock may actually be dangerous, according to recent statistics. More pedestrians are killed by cars during daylight savings time changes than at any other time of the year. In New York City, 40% of pedestrians killed in car accidents were killed between October and December when nights get dark earlier. And this doesn’t just occur in New York City, it occurs all across the nation. The reason for the increase is likely that it gets darker earlier, making it difficult to see pedestrians on the road. Another study found that when daylight savings time happens, people often stay out later in anticipation of the extra hour of sleep. Daylight savings time and driver fatigue seem to go hand in hand, and that can lead to deadly pedestrian accidents. How did Daylight Savings Time Occur? Sources credit New Zealand scientist George Hudson and British builder William Willett with the creation of our modern day Daylight Savings Time. But it was Germany during World War I that actually popularized the idea. In 1916, Germany introduced their version of Daylight Savings Time to minimize the use of artificial light and save fuel for the war. Now more than 40% of the countries around the world use Daylight Savings Time to help conserve energy. A century ago when it was first introduced, Daylight Savings Time did indeed save energy. But now, with modern day life, the amount of energy saved in negligible. After all, even when the sun is out, people are still using computers, air conditioning, TV screens, and washers and dryers, which use a lot of electricity. In 2006, Indiana decided to study the effects of Daylight Savings Time on energy use and they found that it actually increased energy use in their state. It is estimated that it can take up to a week to adjust to the new time change. Thus, you may feel a bit sleepier or groggy even during the day. This leads to drowsy drivers on the road, which can be dangerous. In the spring, when drivers lose an hour of sleep and daylight savings time begins, more accidents occur. Studies have found that eliminating daylight savings time could potentially save up to 366 lives per year! Drowsy driving is dangerous and unsafe. To combat this, experts suggest that you stick to a regular sleep and wakeup time and nap periodically when you need to. In addition to making drivers tired, messing with sleep patterns could make you grumpy or moody. A recent study found that sleep deprivation makes it considerably more challenging to regulate your mood. When drivers are irritable, they are more likely to drive recklessly, and engage in dangerous driving behavior like speeding, tailgating, and road rage. In addition to more car accidents, Daylight Savings Time has been linked to an increase in workplace injuries, construction accidents, suicide, and miscarriages. It is also linked to an increase in depression and heart attacks. If you or someone you love is injured in an accident with a negligent or reckless driver, we can help. Our Colorado Springs car accident lawyers have the experience and skills needed to tackle even complex car accident cases. Contact the experienced attorneys at the Green Law Firm today to schedule a no-obligation consultation and discuss your case. Call us today at 1-719-694-8515.